reapply at least every two hours if skin exposed to sun. Water, Ethylhexyl Palmitate, Cyclomethicone, Dimethicone, Polysorbate 80, Caprylyl Methicone, Glyceryl Stearate, PEG-100 Stearate, C12-15 Alkyl Benzoate, Sodium Acrylate/Sodium Acryloyldimethyl Taurate Copolymer, Isohexadecane, Cetyl Alcohol, Propylene Glycol, Polyglyceryl-6 Isostearate, Camellia Sinensis (Green Tea) Leaf Extract, Glycyrrhiza Glabra (Licorice) Root Extract, Chamomila Recutita (Matricaria) Flower Extract, Algae Extract, Aloe Barbadensis Leaf Juice, Allantoin, Glycerin, Panthenol, Butylene Glycol, Caprylyl Glycol, Alumina, Lauryl PEG-9 Polydimethylsiloxyethyl Dimethicone, Polyhydroxystearic Acid, Triethoxysilylethyl Polydimethylsiloxyethyl Hexyl Dimethicone, Diethylhexyl Carbonate, Triethoxycaprylylsilane, Disodium EDTA, Chlorphenesin, Phenoxyethanol. 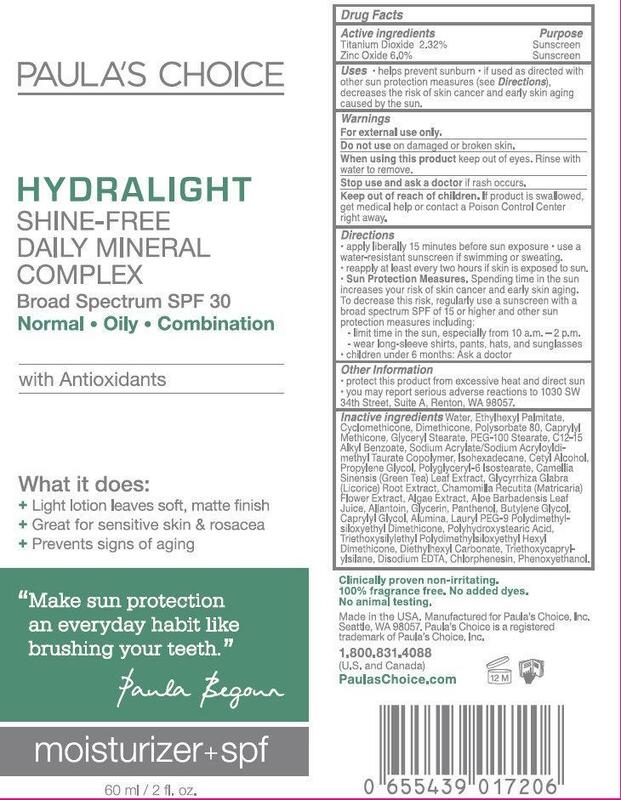 PAULA'S CHOICE HYDRALIGHT SHINE-FREE DAILY MINERAL COMPLEX Broad Spectrum SPF 30 Normal Oily Combination with Antioxidants moisturizer + spf 60 ml / 2 fl. oz.